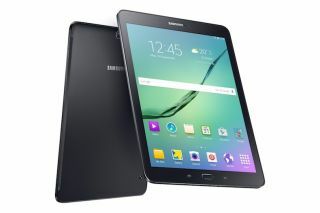 Galaxy Tab S2 - Samsung launches a new range of ultra-thin tablets | What Hi-Fi? Although they were no iPad-killers, we were impressed with Samsung's original line of Tab S tablets. Now the second generation of Tab S has arrived and, on paper, things look promising. There are 9.7in and 8in models to choose from, both of which feature 2048 x 1536 (QXGA) resolution, octacore processors and either wi-fi or wi-fi and LTE built-in. They run Android's Lollipop (5.0) operating system, while internal memory options are 32GB and 64GB, expandable up to 128GB via microSD card. Samsung claims the 'Adaptive Display' feature will intelligently adjust the screen's gamma, saturation and sharpness based on the app used, the colour temperature of the viewing environment and ambient lighting. 'Reading Mode' claims to alter the screen's brightness so you can read for longer without the onset of eye strain. There's a built-in fingerprint scanner for security and Tab S2 comes pre-installed with anti-malware software for increased protection of personal data. The Tab S2 range goes on sale in August, although pricing is yet to be confirmed.